Kindling the team spirit, the WMSU Soccer team prepped for the game. Western Mindanao State University is this year’s over-all champion of the recently concluded Mindanao Association of State Colleges and Universities Foundation, Inc. (MASCUF) Games 2011. 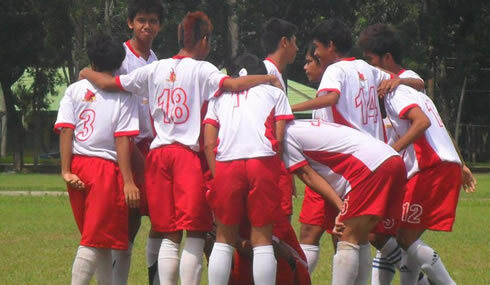 The sports event was held at Kabacan, Cotabato City last January 21 to February 4, 2011. The event serves as an instrument in convening student athletes for camaraderie and sportsmanship among state colleges and universities in Mindanao. The WMSU delegation of 186 athletes was headed by the university president, Dr. Grace Rebollos, together with Prof. Elmer Labad (College of Physical Education, Recreation and Sports Dean) and Manuel Paster (University Sports and Fitness Department Director). Winning a total of 66 gold, 32 silver and 32 bronze, the university outdid other 23 tertiary schools. The delegation was champion among the following sports events: Softball (Women), Baseball, Badminton Mix Doubles, Sepak Takraw, Volleyball (Men), Chess (Women) and Table Tennis (Women). WMSU also landed runner-ups for the following events: Swimming Men and Women (2nd place), Athletics (3rd place), Soccer Football-Men (3rd place), Basketball-Men (3rd Place), Basketball-Women (2nd place), Taekwondo (2nd place), Volleyball-Women (3rd place), Chess-Men (3rd place), Table Tennis-Men (5th place) and Badminton Team (5th place).